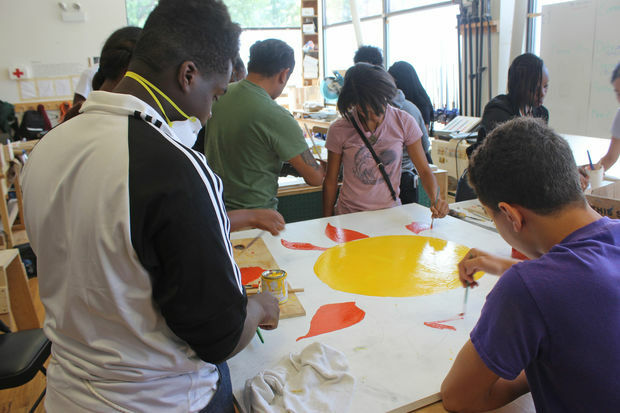 Milik Clay (center) is making a block club sign for 65th and Peoria. WASHINGTON PARK— Milik Clay has been meeting with clients and designing and building signs for block clubs in Englewood and Chatham. The 15-year-old is a part of a six-week summer program at 301 E. Garfield Blvd. taught by instructors from the University of Chicago. Milik and his class have been commissioned by block club presidents to design and build signs for their blocks. Jahmal Cole, founder of the My Block, My Hood, My City group helped organize the project by bringing the block club presidents to the apprenticeship program. 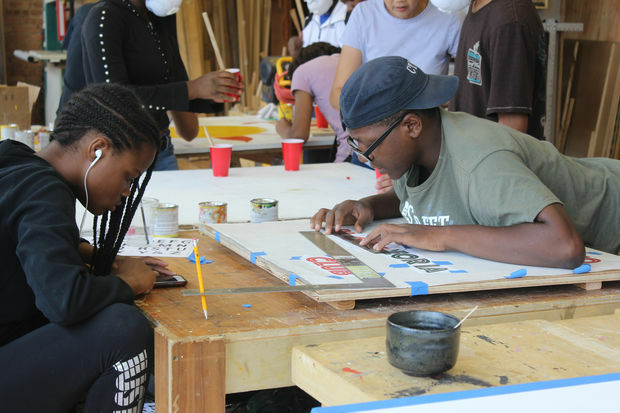 The students have been learning about carpentry, font sizes, drawing and design studio skills, said Gabriel Moreno, an instructor who teaches the class year-round. Milik, who lives in Woodlawn, said that the program has been fun but challenging. His small group is working on a sign for 65th and Peoria. The current signs are outdated, he said. He said he hopes that the sign he’s making will make the block more vibrant and appealing. 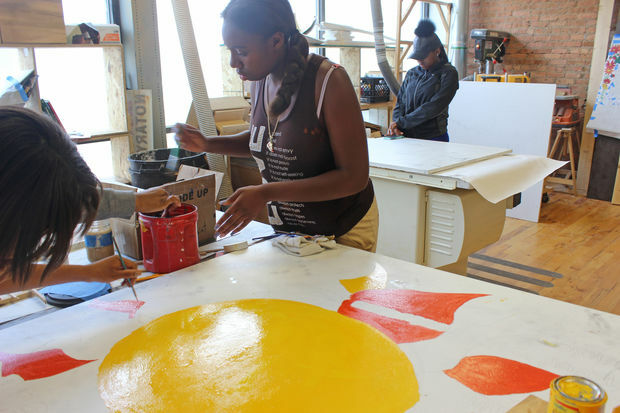 Jamaia Johnson, 16, came up with the idea to paint a sun for her assigned block, 76th and Indiana. The experience for her has been a good one, she said, with lots of research and planning. She likes using her creative side, though, and this summer job has given her that opportunity. Cole said that he runs through Chatham every morning and got tired of seeing the old block club signs. He wanted to see fresh, new ones, so he reached out to Theaster Gates for help. Gates referred him to the U. of C. arts incubator, which was already working with teens during the summer through After School Matters. Cole brought in the block club presidents. 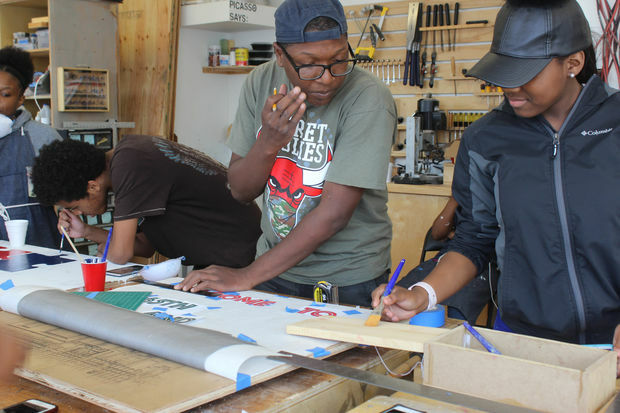 He said 10 people submitted information to him, and through the Safe Summer Chicago grant for $10,000, he’s getting permits, materials and planning a "Block Club Sign Reveal" party from 5-8 p.m. Thursday at the Currency Exchange Cafe. Food and pop will be provided. This project is a part of his initiative called "One Block At A Time," in which volunteers do things like shovel snow and meet quarterly to discuss volunteer events. The next one is the Woodlawn Clean Up on Aug. 19.